Ready to get your heart pumping? Put on your walking shoes. Here we share our top ten viewpoints to hike to in Europe, with directions for how to reach them! This post contains all original photography and thoughts by North to South. Republishing without our consent is not permitted. We huffed and we puffed our way up the switchback trail to the Salzwelten Skywalk (map) in Hallstatt’s springtime. 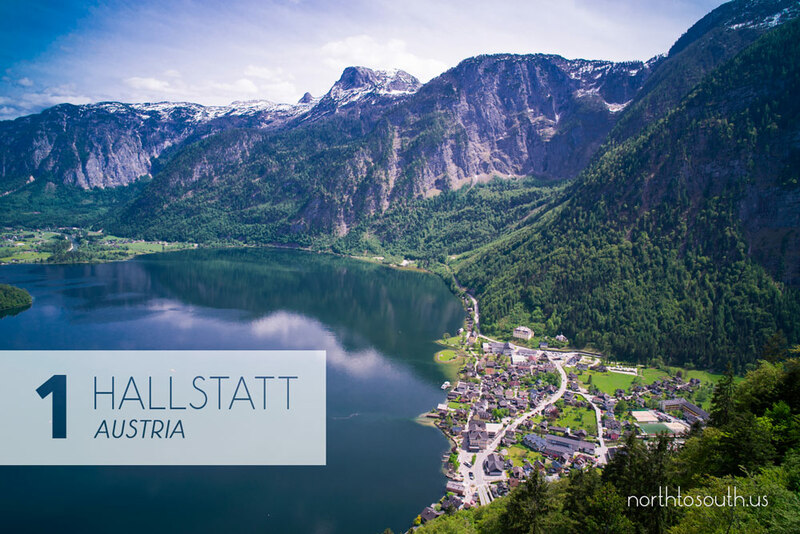 The mostly shaded trail begins next to the Salzwelten ticket counter in Hallstatt and offers lovely lake views the entire way. You’ll get plenty hot from the incline, so pack water and don’t wear heavy clothing. At the top, enjoy an epic 180-degree view of the mountains, lake, and surrounding towns. There’s a free overhanging platform (“Skywalk”) and a restaurant (photo) at the top with this awesome view, and the Salt Mine tour is another 10-15 minutes’ walk away. Alternative: You can take a funicular to this viewpoint (€16 round trip; save €8 if combined with €22 Salt Mine tour ticket). For some unique urban exercise, why not take the stairs up the Eiffel Tower? With the open structure, you won’t feel claustrophobic, and there’s room to stop for a breather on the many landings and first floor on the way up. When you arrive under the tower, locate the foot labeled “Stairs” to purchase your stairs ticket (€7) to the second floor, where the stairs end. You’ll need to purchase a separate ticket (€6 — bring cash) for the elevator from there to the top. The stairs weren’t crowded when we visited in April, but we experienced some short waits at the ticket counters (especially the one for the summit). Altogether, you’ll save €4 by not taking the first lift. 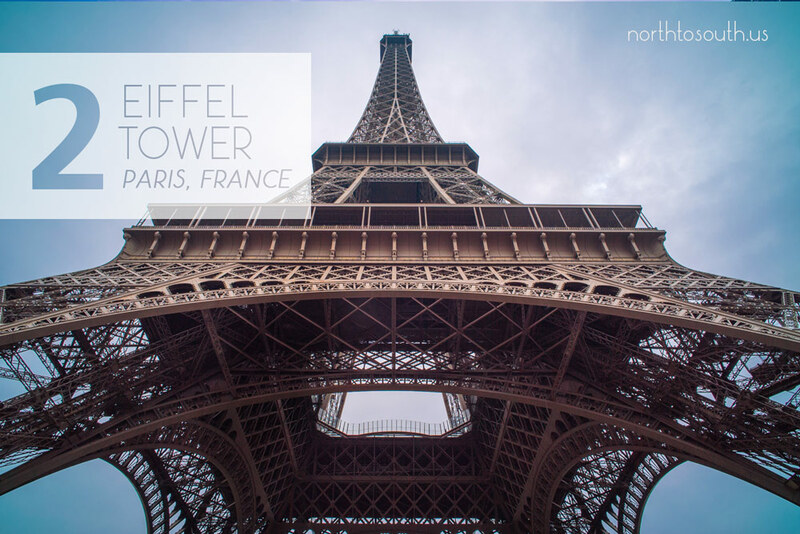 Check current Eiffel Tower entrance fees here. Like to hike? View a collection of our favorite hiking gear here. Pack your passport — You’re crossing a border! It took several hours, but we literally walked all the way from Spain to the top of the Rock of Gibraltar… and back. 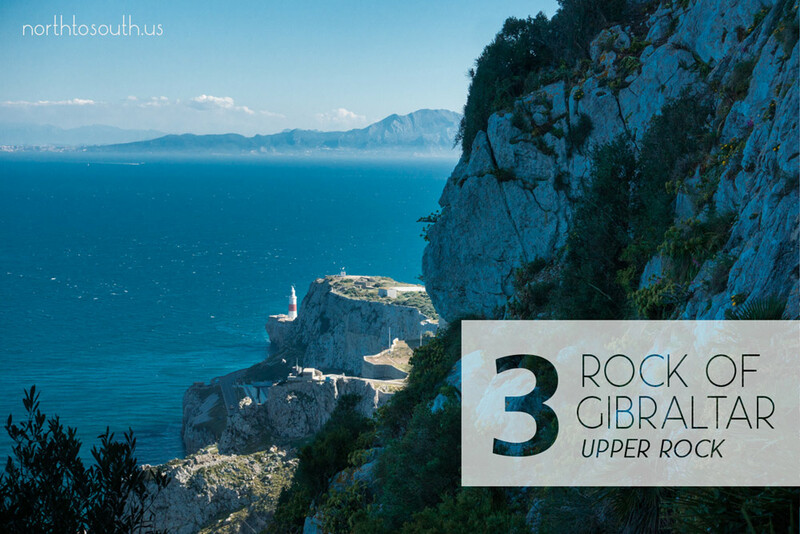 Aside from taking in some awesome views, on this hike you’ll walk across an airport runway, conquer the infamous Mediterranean Steps, and observe the resident apes of Gibraltar. (The view above is from the Mediterranean Steps.) Pack water and £0.50 (or €1) per person for the walking entry fee at the entrance to the Nature Reserve, and don’t miss the barbary macaques at the Upper Rock before heading back down! Details from our hike to the Top of the Rock of Gibraltar here. Alternative: If all this walking sounds crazy, take the cable car up (£10.75 one-way, £12.75 round trip; includes free shuttle from the frontier) or down. If you take the cable car up, you can do the Mediterranean Steps (1-2 hours) down and around the opposite way instead. 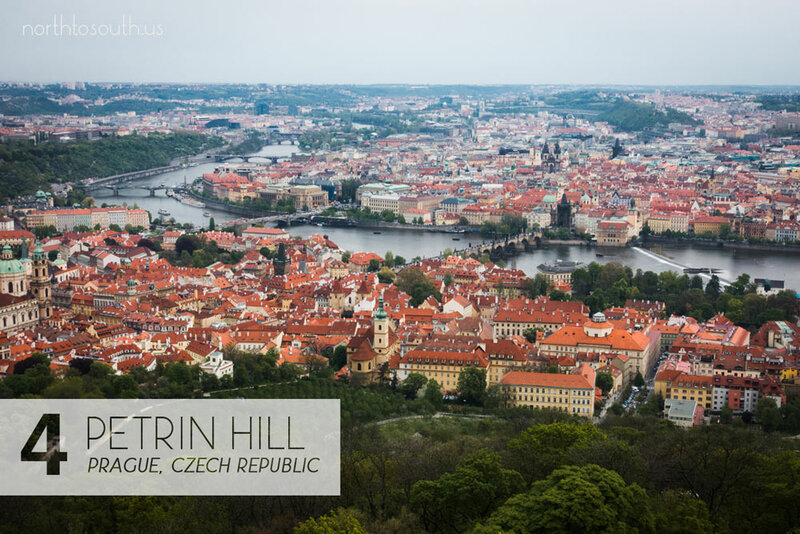 The walk to Petrin Hill offers lovely views itself, but trek up the 299 steps to the tower’s summit for a truly awesome view of all of Old Town Prague and beyond (on a clear day you can see all the way to Snezka, the Czech Republic’s tallest peak, 150km away). Opting for the stairs over the lift offers 360-degree views all the way to the top. When you reach the summit, glass windows offer clear views all around, but you can snag a spot at one of the open windows to take a better photo. Prices and more info on the Observation Tower here. Alternative: If you don’t want to walk all the way up Petrin Hill to the tower, take the funicular (32 czk one-way) from Malá Strana. You can also take a lift up the tower for a small extra fee. Lastly, if you’re strapped for time or heights aren’t your favorite thing, check out Prague’s Lesser Tower (map) for what’s actually my favorite 360-degree view in the heart of Old Town at the west end of the Charles Bridge. It was right around the corner from our Airbnb! View our favorite places we stayed in Europe on our list of Preferred Accommodations. Gellért Hill is covered in trees, making for a shady hike up to the tallest viewpoint in Budapest. Here you’ll overlook the uniquely iconic architecture of the city, the Danube, and all of Budapest’s famous bridges from the city’s southwest corner. The hike is free and you can begin on either the northern or southeastern side of the Hill. At the top you’ll get a closeup look at Budapest’s iconic Statue of Liberty and an exterior view of the Citadel, a fortress that’s served a variety of uses since its construction in the mid 1800s. Take some HUFs along for a lángos (a traditional Hungarian snack of fried dough covered in sour cream and shredded cheese) at the top. Afterwards, walk down the hill on its south side and relax with some spa time at Gellért Thermal Bath. Alternative: A road from the west gives you driving access to the citadel. For another fantastic (though not as high up) view from the Buda side, take the funicular up to Buda Castle instead. This is a two-part post! View Part 2 here.